In this video tutorial, you will learn how to use div tags and css to create a simple responsive website using Dreamweaver. For this illustration, I have used Adobe Dreamweaver CS6 as my html editor, you can use any editor you have. 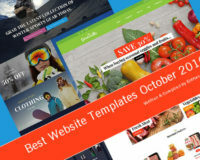 a) Create a website layout using div tags and css. 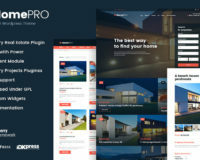 b) How to make the website layout responsive. c) How to create a custom css menus (navigation bar). Step – 1: Open Adobe Dreamweaver CS6, go to your file panel, right click and say new file, I am going to call this index.html, you can call it what ever you want. 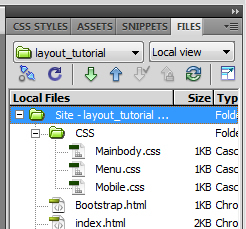 Step – 2 : Right click on your files panel and create a new folder and name it CSS. What we are going to be doing is creating external stylesheets, the reason we do this is, it comes in handy further down the line and also when creating websites having extensive number of pages, we can update a single stylesheet and changes will take effect side wide rather than having all of our css within a single document and having to update them all individually, it is also benificiary because it makes our code all the more clean. 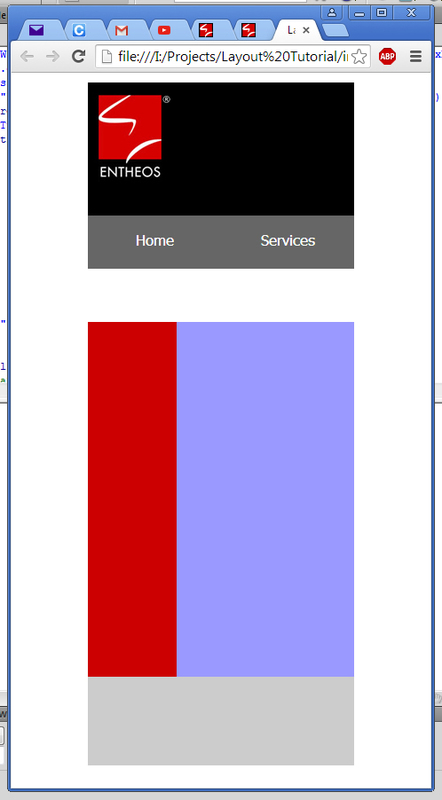 Step – 4: Open the index.html and give it a title it, I am calling it Layout Tutorial, you can name it whatever you want. when you look at the design view, you will see that the cursor is in the middle of nowhere, actually when it comes to writing css and creating div tags and elements, this is going to effect positionally. 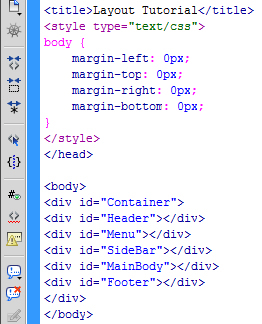 So to fix this, we will set a margin to this, I am going to the page properties found at the bottom of dreamweaver and set all the left, right, top and bottom margin to “0” and then save it, you will see that dreamweaver has already written the css codes for us, you will also see that the cursor is now to aligned to the left. 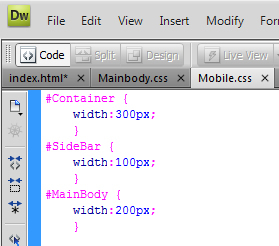 If you go to the design view, what you can see is just a container, because there are no css written at this point of time, we see this blank box, because there is no css there is no rules to tell the webpage how to display the div tags hence the requirement to use css to mould and design our page. and copy the codes from there. At this point of time, I would want to bring in my logo on the header section. 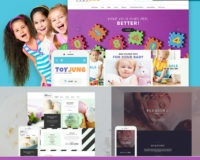 When you go to the design view you will see that you have created a website layout using divs and css with dreamweaver. 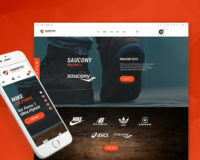 b) How to make this whole webpage responsive, that means make it look different on different screens/ gadgets etc., we use different style sheets to define the width and also by using media queries. We will be calling in this style sheet based on a condition, and the condition is that if the webpage is being viewed in a device that is less than 800 pixels width, in other words, anything that is viewed more than 800 pixels this stylesheet will not be used and anything less than 800 pixels, this Mobile.css stylesheet will be used. You can now launch the index.html on a web browser and see that this layout with reduced to a mobile size the layout also changes, so now we also know how to make a webpage layout responsive. 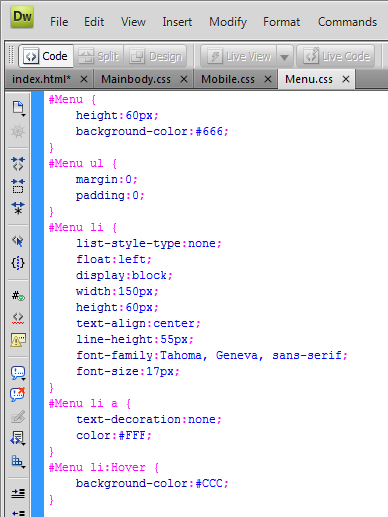 c) Moving to the final stage of this tutorial, we are going to learn how to create a custom css menus. 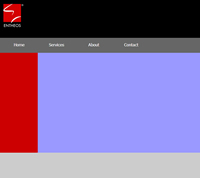 Now if you save this css and then launch the index.html on a web browser, you will see that the website layout is now ready with a custom css menu and we did this by creating divs and css, this is also responsive. 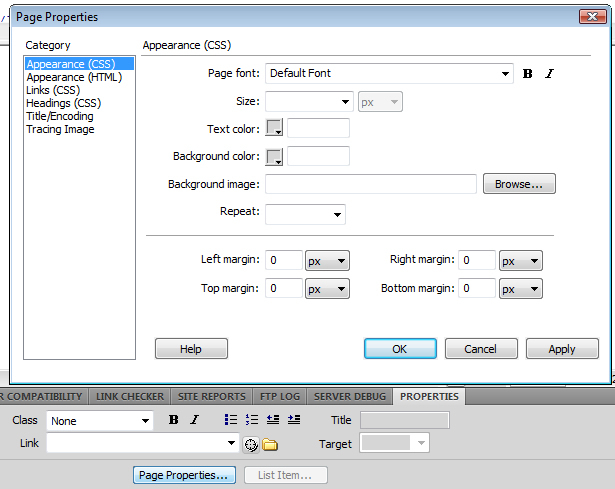 You now know how to use div tags and css to create a responsive website layout and custom css menus using dreamweaver.